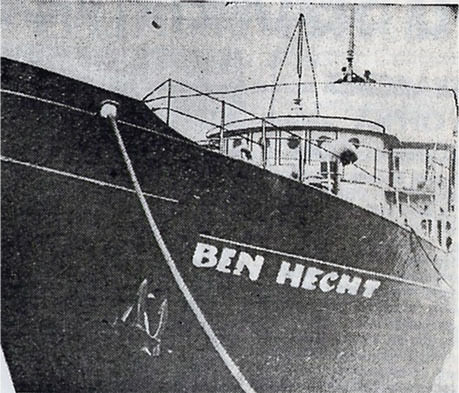 The Bergson Group used the proceeds from “A Flag is Born” to purchase a ship, renamed the S.S. Ben Hecht, which attempted to bring 800 Holocaust survivors from Europe to Palestine in 1947. The ship was intercepted by the British and the passengers were interned in Cyprus until Israel’s establishment the following year. The crew members, mostly American volunteers, were held at the Acre Prison for several weeks, during which time they assisted Irgun prisoners in preparations for the famous breakout from the fortress jail. 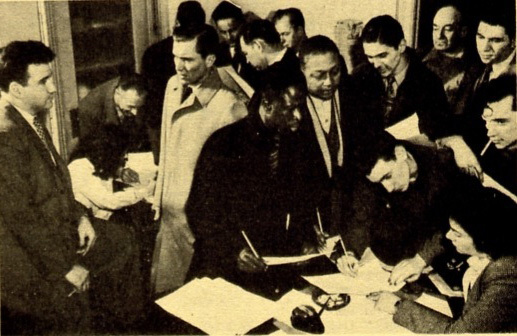 The scene at the Bergson Group’s New York headquarters as would-be crew members of the S.S. Ben Hecht signed up to be interviewed. 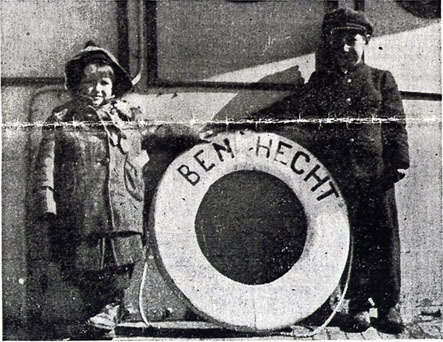 Members of the crew of the S.S. Ben Hecht: a. David Irving Gutman, age 21, Oiler 3. He lived on Sedgwick Avenue in The Bronx. b. Harry Herschkowitz, age 30, A.B. He lived on 11th Street on Manhattan’s Lower East Side. c. Shepard Rifkin, age 28. He lived on West 8th Street in Manhattan. d. Henry Mandel, age 26, Oiler 1. He lived on Kelly Street in The Bronx. e. Louis Brettschneider, age 24, 3rd Eng. He lived on 52nd Street in Brooklyn. f. Robert Nicoli, age 24, A.B. He lived in Midlothian, Illinois. g. Edward R. Styrak, age 23, Sparks 2. He lived in Mount Clemens, Michigan h. David Kaplan, age 20, Sparks 1. He lived on Bedford Avenue in Brooklyn. (Courtesy of the Institute for Mediterranean Affairs.) Not pictured: Jeno Berkovitz, age 28, Messman, of Wales Avenue in The Bronx. Walter Cushenberry, 33, Steward, of 52nd Street in Brooklyn. Walter “Heavy” Greaves, 29, 3rd Mate., of South Street in Manhattan. James Heggie, 33, Bos’n A.B. , of Clymer Street in Brooklyn. Hyman Robert Levitan, 27, Captain, of 14th Avenue in Brooklyn. Albert Hirschkoff, age unknown, Press, of 57th Street in Brooklyn. Wallace Litwin, 32, Photographer (Wiper), of 8th Street on Manhattan’s Lower East Side. Norman Edward Luce, 44, Cook, of South Street in Manhattan. Louis Markowitz, 53, 2nd Mate, of Washington Avenue in The Bronx. Harry Nathan Schatz, 48, Oiler, of Indianapolis. Jack Winkler, age 20, O.S. , of Milwaukee. Haakom Lilliby, age unknown, Chief Eng., of Norway. Erling Sorensen, age unknown, 1st Eng., of Brooklyn and Norway. 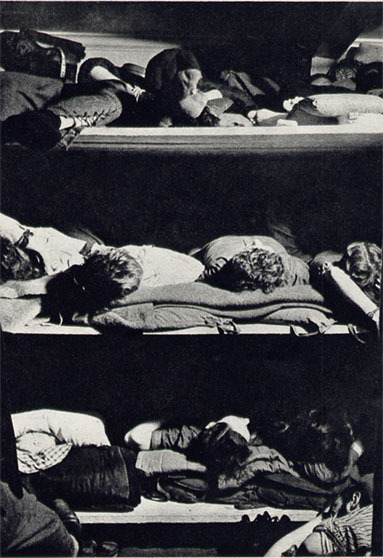 The “beds” on which the refugees slept on the ship were little more than wooden shelves. The cramped accommodations were necessary in order to enable as many passengers as possible to fit board. 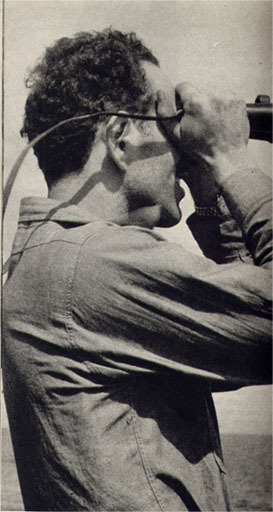 Captain Bob Levitan watching the British patrol plane approaching the Ben Hecht. TOP: Thinking that the ship might be able run aground, enabling them to step out into the shallow water and make it to shore, these refugees quickly put on as many of their clothes as possible, when they saw British patrols boats approaching. 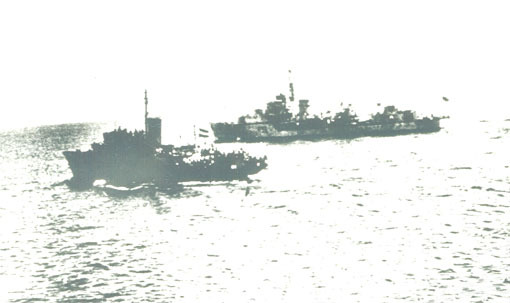 BOTTOM: British naval police boarding the Ben Hecht. TOP: Crew members from the Ben Hecht in the Acre prison. 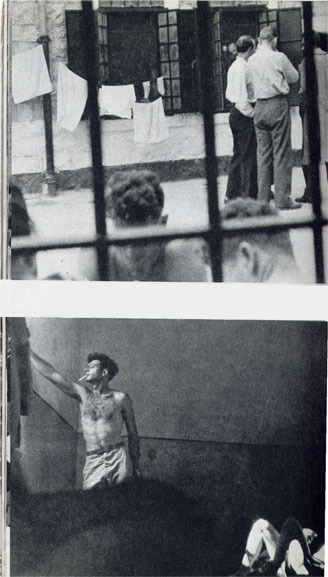 BOTTOM: Two of the Ben Hecht crew members in their cell at Acre: David Gutman (standing) and Harry Hershkowitz. Taken to Acre Prison, a fortress on Palestine’s northern coast, the crew of the Ben Hecht were housed together with prisoners from the Irgun Zvai Leumi, the underground militia, headed by Menachem Begin, which was fighting against the British for Jewish independence. The Irgun men were delighted to discover that the Ben Hecht’s captain, Bob Levitan, had smuggled a small camera into the prison. 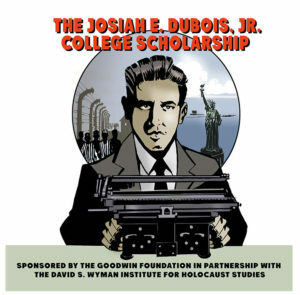 For some months, the Irgun had been carefully planning an attack on the Acre prison to free its many imprisoned fighters. At the last minute, the plan stalled because the escapees would need identification papers, with current photographs, to avoid being arrested at British roadblocks. The prisoners had no means of supplying such photos to their comrades on the outside–until Levitan gave them his camera. 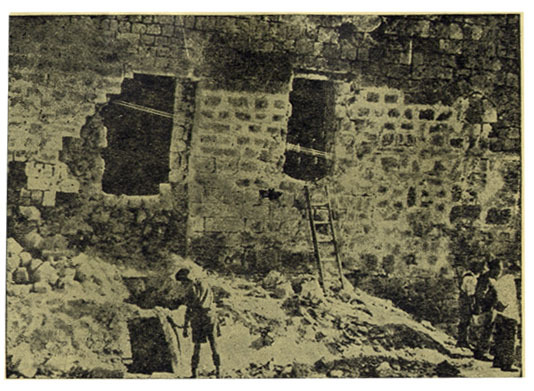 On May 4, an Irgun force blew open the fortress’s southern wall, as prisoners used smuggled explosives to destroy cell doors and internal walls. Forty-one Jewish fighters escaped in the daring raid, which the international media described as the most spectacular prison break of modern times as well as a major blow to British prestige. 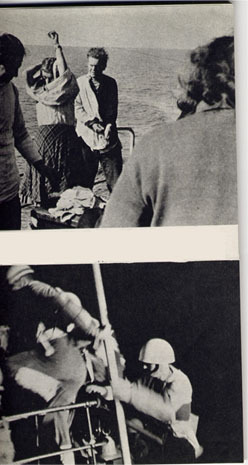 The operation was later immortalized in the film Exodus. The photo above shows the holes that the Irgun blasted in the prison walls, through which their comrades escaped.